Let’s jump onto the Gut Health Bandwagon. It could be by far one of KEY nutrition strategies to date to build a fortress for your better health. We have all heard the phrase “Tell me what you eat and I will tell you what you are”. However, given the last two decades of brilliant research on the Gut Microbiome it’s time to update the French author, Anthelme Brillat-Savarin’s phrase with: Tell me how you seed and feed your Gut Microbiome and I will tell you what your health can be! So put your head and arms inside my “gut-car” window, roll up the windows and tune in for the next 6 weeks as I place my foot on the gas pedal towards 21st century gut based functional medicine: Gut Health Trilogy. We also know that we build the micobiome from the time we are born. It isn’t fixed and we can develop it over time. It changes for the better or worse based on its environment that it is exposed to. We can do a lot to change it for the better by eating healthier foods and activate other healthy lifestyle factors, like stress management, and moderate exercise. Or we can tear it down with stress, surgery, illness, trauma, antibiotics, and unhealthy eating habits. Your Gut Microbiome Is Talking To You But Are You Listening? It’s a well-known fact that 70-80% of our entire immune system resides in our intestinal track. Furthermore, we know that the microbiome not only talks to our immune system 24-7 but it cross talks to our central nervous system. Did you know that we have more serotonin receptors in our gut than in our brain? Whoa! Our gut microbiome can either become our brain’s peacekeeper or tormentor depending on the diversity and the good:bad ratio of the strains. The research is on a fast track adding to my Microbiome “to read” each week. The bottom line news is that the health of your gut microbiome has far reaching health benefits on your metabolism (1), organs, and diseases including, asthma, cancer (1), diabetes, arthritis, obesity, anxiety, depression and autism. Feed And Seed Your Gut. I want you to think about your microflora as temporary visitors. They come and go. Like your mother-in-law who will come to baby-sit for you, you can influence her/them to stay longer by making “their” accommodations (in your gut) more comfortable by feeding them well (i.e. pre-biotics and fiber). If you do they will stay a bit longer and “work” for your health benefit. Conversely, we can also kick them out ASAP with the wrong lodgings (i.e., stress, Standard American diet, antibiotic therapy, antibodies and pesticides in our food and water, environmental toxins, low fiber diet). 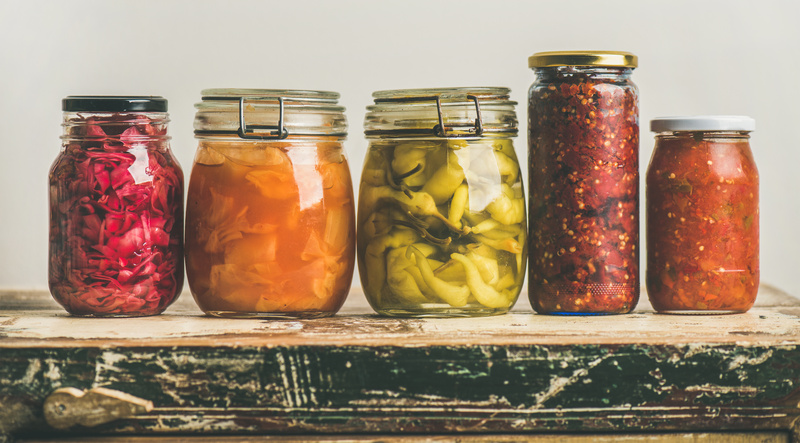 Bottom line, if you want to build a fortress of health, you must seed your gut with fermented food a few times a day (i.e., a few bites with each meal preferably) and feed them prebiotic foods/plant fibers daily. Dorignac’s is in the process of creating a specialized Fermented Corner to help you seed your gut. In addition, you will find different pre-biotic foods throughout the store to feed your microbiome. Download this chart to help you plot your course to build your gut fortress for the best health. Stay tuned to 2nd part of the Gut Health Trilogy! Off to the market to get my fridge properly stocked so I can show up for my life with all seratonin cylinders firing! Thank you, Diana!! I can’t wait for Dorignac’s to have a fermented corner ~ this is cutting edge! I would like to download the chart, but I do t see a link. Hi Debbie – You can download here. Thanks!